Day1 Depart for Lisbon Make your way to your local airport, where you will board your overnight flight(s). Your meals will be served on board. Day2 Arrive Lisbon Upon landing at Lisbon Portela Airport, make your way to the baggage claim area and collect your luggage. Proceed to the arrival's hall, where you will be greeted by your tour guide and/or driver. You will be escorted to the bus and we will begin a panoramic sightseeing tour of the coastal city of Lisbon. We will stop at the St. Jerome's Monastery, built to give thanks to the Virgin Mary for guiding Vasco da Gama on his voyage that linked Europe and Asia. Continue to drive by the Belem Quarter that contains the iconic entry way to the Lisbon harbor, the Belem Tower. This important structure of history has many beautiful sculptures, such as depictions of, St. Vincent and Our Lady of Safe Homecoming. We will continue and " pass -by" the "25th of April Bridge", inspired by the Golden Gate Bridge of San Francisco, California. The Ponte 25 de Abril is the oldest bridge that connects the Tagus river of Lisbon. Following, we will drive by the Discoveries Monument. This memorial commemorates the Great Explorers who, as a result of their explorations, brought Portugal to a standing of wealth and power during the Age of Discovery. This ship prow shaped structure stands at the point where the Great Explorers began their expeditions. Enjoy a view of the Basilica of the Star, the Rossio Square, Commerce Square, and the Marquee of Pombal Square. Our last stop will be St. Anthony's Church to celebrate Mass. Although this patron Saint of lost things is known as St. Anthony of Padua (Italy), he was originally born in Lisbon, Portugal. This Church is built upon the site of St. Anthony's birth, and is also where Saint John Paul II visited in 1982. The former Pope stopped at this Church, on his way to Fatima, to pray to Our Lady in thanksgiving. Saint John Paul II recognizes Our Lady as saving him from being killed when he was shot one year prior, in 1981. After Mass we will check-in at the hotel and enjoy a welcoming dinner followed by a restful overnight. Days 3 Lisbon - Santarem - Fatima Today, we will travel north to the old city of Santarem. In Santarem visit and attend Mass at the Church of St. Stephen, which holds (13th century) Eucharistic Miracle: The Miracle occurred when a woman yearned to change the ways of her unfaithful husband and consulted a sorceress. The sorceress agreed that she would cure the husband's infidelity in exchange for a consecrated Host. The woman committed the sacrilege, but when she exited the church, the Host began to bleed. It bled so much that her fellow parishioners thought she had cut her hand. The woman ran home and hid the bleeding Host in a trunk. When her husband arrived home, the wife told him what she had done, and later that night there was a light emanating from the trunk. She and her husband began to kneel before the trunk. The following morning, the husband and wife brought the Host to the parish priest. It was then moved to the Church of St. Stephen where another miracle occurred; the miraculous Host was originally put in a wax container, however, when a priest opened the tabernacle to view the Host, the container was found broken, and the Host was found enclosed in a crystal pyx. Continue to Fatima with a visit to the Hamlet of Aljustrel, the home of the three shepherd children; visit of the Parish Church and Fatima Parish Cemetery. Dinner and overnight. Day4 Fatima Today will surely be a memorable experience as you pray and meditate upon one of Our Blessed Mother's apparition sites. Our Lady appeared to three shepherd children; Lucia (age 10), Jacinta (age 7), and Francisco (age 9). These apparitions occurred monthly from May until October of 1917. Historically, as the entire world was in true turmoil, Our Lady's most prominent message during this time was to pray for world peace. The destruction of the world at that point in history was also mentioned by Our Lady in her messages of Fatima, and more specifically, in her second secret to the children. Our profoundly reflective day begins with a visit of the Little Chapel of the Apparitions. This simple, yet modern, chapel is the site of where the Virgin Mary first appeared on May 13, 1917. Continue with a visit of the stunning neoclassical church, the Basilica of Our Lady of the Rosary. This Sacred space contains the tombs of Blessed Francisco, Blessed Jacinta and Sister Lucia. View the monument, that commemorates the Sacred Heart of Jesus , in the square. Due to Our Lady's consistency in Her messages to pray the Rosary, this Basilica also features fifteen altars that are dedicated to the fifteen mysteries of the Rosary. While in the Basilica, you will be able to feel, through the Love of Our Lord and Lady, the many graces that were received here. Visit the Museum with the exhibition: Fatima: Light and Peace. Continue with a visit of the Holy Trinity Basilica. After free time for lunch, we will experience Christ's unconditional love by participating in the Stations of the Cross along the Via Sacra. The "Sacred Way" marks the path taken by the shepherd children of Fatima to their first apparition with Our Lady. It is composed of fifteen small chapels in commemoration of the Passion of Our Lord. The fifteenth station, the Resurrection, can be found close to the Chapel of Calvary, dedicated to St. Stephen, King of Hungary. Ending the day with visit of Valinhos, the site of Our Lady's August 1917 apparition and the first and third apparition of the Angel. Your night will conclude with private devotions, and a candlelight procession, requested by Our Lady (1917). Enjoy dinner and a comfortable night's rest in Fatima. Day5 Fatima - Salamanca Depart Fatima and head to Salamanca, following a full breakfast at the hotel. Salamanca is a city in the Castilla y Leon region, and is known for its large University, the oldest in Spain that is still active, and prominent culture. Our walking tour will bring us by the most noteworthy sites such as; the grand Plaza Mayor, an iconic square filled with food, shopping and city events; La Clerecia, a church and college of the Jesuit Order that was constructed in the seventeenth century; La Casa de las Conchas, currently a public library but also, a monument noted and decorated by its shells, which symbolizes the ever-famous pilgrimage to Santiago (El Camino); the University of Salamanca, the oldest University in Spain and the third oldest in Europe; the Roman Bridge, extends along the River Tormes, is a national monument and among one of Salamanca's sturdiest bridges; La Iglesia de San Marcos, constructed in the Romanesque style and contains breathtaking paintings that portray many scenes of Our Lady's life; La Iglesia de San Martin, a church devoted to St. Martin de Porres, who is the patron saint of mixed-race people and all those seeking interracial harmony. Visit inside the two joint Salamanca Cathedrals (old and new), one of which is of a Romanesque style and the other is of a Gothic style. Following this eventful day, you will return to your hotel for a delicious meal with your group and an overnight at your hotel in Salamanca. 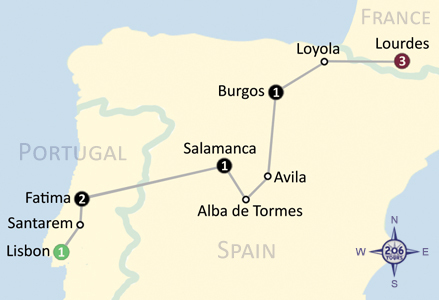 Day6 Salamanca - Alba de Tormes - Avila - Burgos This morning, after breakfast, you will board the bus and enjoy a short transfer to the village of Alba de Tormes. This town is home to the Carmelite Monastery that Saint Teresa founded in 1571. Upon arrival in Alba de Tormes, your group will celebrate Mass at this Monastery where the saint died and was buried. Following Mass, you will have the opportunity to visit the museum dedicated to St. Teresa of Avila, which also holds her incorrupt heart and left arm. Your group will enjoy free time for lunch on your own, before continuing to the medieval city of Avila. Upon arrival in Avila, you will immediately notice the perfectly preserved eleventh-century walls that surround the old town. The conservation of architecture in this city, to which St. Teresa was born, deems its shrines, convents and churches necessary to visit on any Catholic pilgrimage. Avila with the Cathedral de Avila, whose artwork and architecture encompasses the Romanesque, Gothic and Renaissance styles; La Basilica de San Vicente, of which stands on the site of the martyrdom of St. Vincent. Visit of the Incarnation Convent, where St. Teresa became a nu. Saint Therese convinced Saint John of the Cross to reform the male Carmelite order. Saint Therese had started the reform when she met Saint John in Medina del Campo. Followed by El Convento de Santa Teresa, built upon the home of St. Teresa and contains the relics of hers and of St. John of the Cross. After walking in the footsteps of St. Teresa, continue your journey to Burgos. Upon arrival in the historic capital of Old Castile, enjoy dinner. Following dinner, you will have the opportunity to explore the city of Burgos, and admire its magnificent limestone, gothic-style Cathedral. Late this evening, you will return to your hotel for a restful overnight. Day7 Burgos - Loyola - Lourdes Following breakfast, transfer from Burgos to Loyola to visit the birthplace of St. Ignatius, founder of the Jesuit Order. St. Ignatius dedicated himself to becoming a soldier of the Christian faith, and as a result of many tribulations, he wrote the ever-famous Spiritual Exercises. In Loyola, you will see the 17th century Basilica that is dedicated to this remarkable Saint. The Basilica is part of a series of buildings that surrounds the "Holy House," the birthplace of St. Ignatius. When you visit these Holy places, you will also have the opportunity to pray at the most venerated room, where St. Ignatius prayed and began his conversion. After meditating on the life of this founder of the Jesuit Order, you will enjoy free time for lunch and board the bus for the next destination. We will continue to Lourdes with a spectacular view of the Pyrenees Mountains. Upon arrival in Lourdes, you will check-in to your hotel and enjoy a splendid dinner and peaceful overnight. Day10 Lourdes-Oberammergau After breakfast depart to the airport for your flight to Munich. Upon arrival at Munich Airport, make your way to the baggage claim area and collect your luggage. Proceed to the arrival's hall, where you will be greeted by your tour guide and/or driver. Enjoy a picturesque ride through Bavaria arriving at your hotel in Oberammergau (or nearby). Time permitting walk the quaint streets of Oberammergau. The incredible 2,000 Oberammergau citizens are the actual actors, singers, instrumentalists and stage technicians. They are ordinary citizens who lead an everyday life. Later in the afternoon we will celebrate Mass followed by a welcome dinner and overnight. Day12 Oberammergau - Munich After breakfast, we will depart the Oberammergau area to Munich. Munich is the capital of Bavaria, one of Germany’s popular destination. Upon arrival enjoy visiting many of Munich’s top sites; Marienplatz with its world famous “Glockenspiel’ ; the twin-towered Frauenkirche (the Church of Our Lady), which serves as the cathedral of the Archdiocese of Munich . The Cathedral is widely considered a symbol of Munich. Celebrate Mass followed by free time for lunch and/or shopping. Dinner and overnight. Day13 Return from Munich to your hometown Today we fondly say “auf wiedersehen” to Germany, we say farewell to our fellow pilgrims and new friends! Although it’s an end of this journey, graces and blessings from our pilgrimage will last a lifetime.